Of nine members of this warthog family, there are two moms; one with four babies and the other with three babies. From watching this family almost daily over a period of 18 days, we believe the mom shown above is the mom of the three babies, which if you look closely are all nursing. (It's hard to see the third). Thus, the baby on which she is resting her chin belongs with the other mom who is nearby and seems comfortable with this situation. We couldn't have laughed more when the fourth baby, whether hers or not provided this neck resting spot. With the holidays imminent, we imagine that most of our readers are busy with preparations and events leaving little time for our daily musings and photos. We will continue to post each day presenting an abbreviated version that can easily be perused and caught up after the holidays, if you so choose. The "three little pigs" quit nursing and took off following the other mom as she'd had enough of us for one day. However, tomorrow we'll pick up our rental car and with that, begin exploring, offering what hopefully will be exciting new content as we venture out beyond Marloth Park. Also we'll commence on our own game drives in the area including Kruger Park (which we'll visit after the holidays). Notice the size of the ant hill behind Tom, located in our yard where there are several. The thought of entering Kruger Park in a tiny economical vehicle is a little intimidating when we've seen photos of elephants knocking cars on their sides. But, we certainly won't antagonize any of the wildlife which is often a precipitating factor in any angry animal behavior. On our way out to dinner on Tuesday night, these wildebeest were hanging out in the front yard of a house. 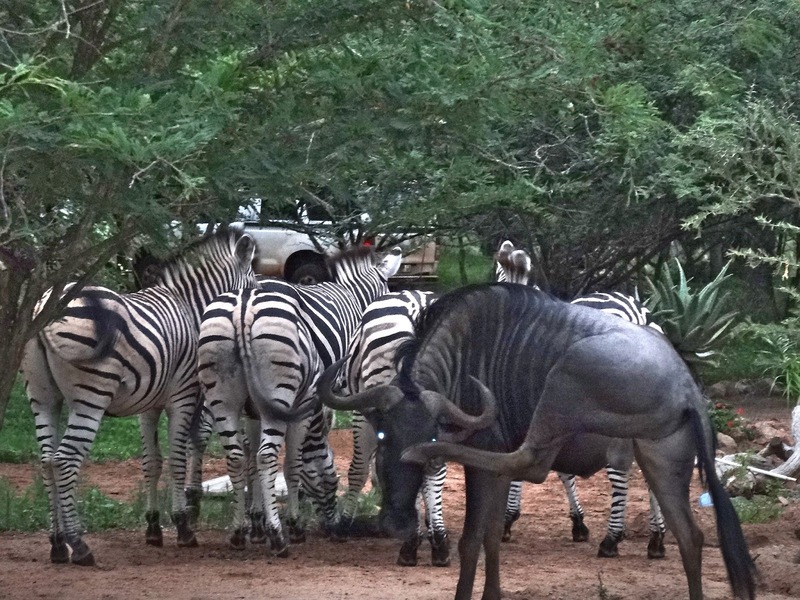 We've heard that Kruger has increased the vehicle limits over the holidays due to the increased number of tourists in the area from 500 per each of the 11 entrance gates to 700 per gate. Over the holidays, vehicles will be backed up on the narrow roads inside the park. 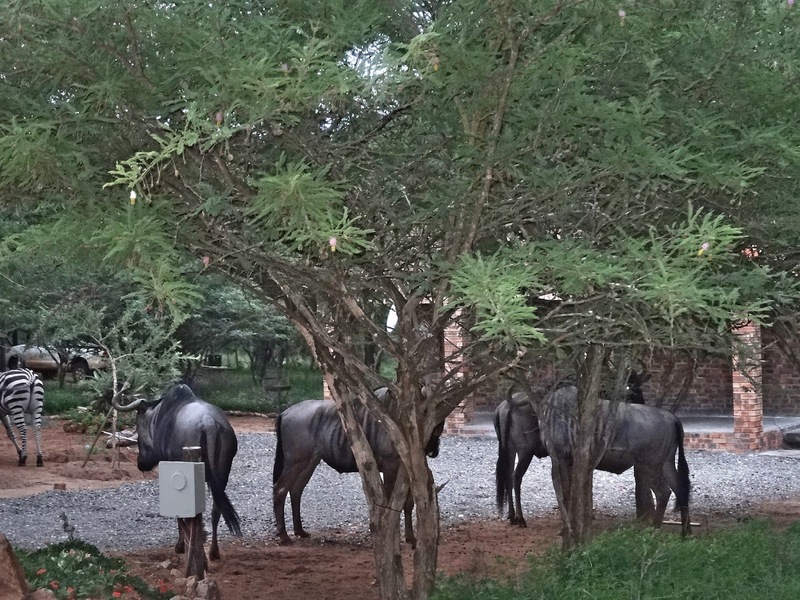 We prefer to wait to visit Kruger until after the first of the New Year. The fees for "internationals" to enter Kruger Park are ZAR $248, US $24.31 per person, per day. One of the first things we'd like to do shortly is to return to the Crocodile River overlook. Alcoholic beverages are allowed and Tom can enjoy a cocktail while I sip on my ice tea for a delightful "happy hour," as often as we'd like. There is no fee to enter the overlook area. 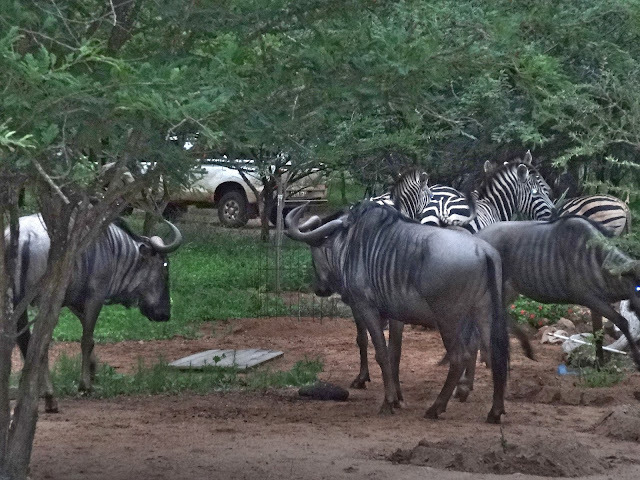 Why all these zebra butts were facing the wildebeests escaped us. The prospect of the freedom of driving ourselves is refreshing. After we pick up the rental car, run a few necessary errands in the larger city of Nelspruit, we'll dine at the popular Hamilton's located in the cozy town of Malelane (pronounced mal-e-lawn). The distance from Hamilton's back to Marloth Park is 42 km, 26 miles. Nothing is close to Marloth Park. Okee Dokee is driving us to Nelspruit from Marloth Park tomorrow at 12:30 pm at a distance of 95 km, 59 miles. Stopping for wildlife sightings certainly lengthens the normal 75 minute driving time. Tomorrow will be a busy day of driving which we don't mind at all. With our new found ability to stop and take photos along the way at our leisure, we're both looking forward to being out. These past almost three weeks of waiting and watching for visitors has been glorious. Now, with Marloth Park jammed with holiday tourists, we've noticed a decline in the visitors over the past four days. Danie explained that the animals roam from spot to spot foraging along the way. As the rains come (it's rainy season now as summer begins on December 21st) and more vegetation grows, they move on to the next prolific location, returning to past locations in a period of time. This makes sense to us but I wouldn't be surprised if all the extra cars driving on the roads and people at the resorts and vacation homes could certainly have a bearing on the wildlife moving about as freely, considering how cautious they are around us humans. 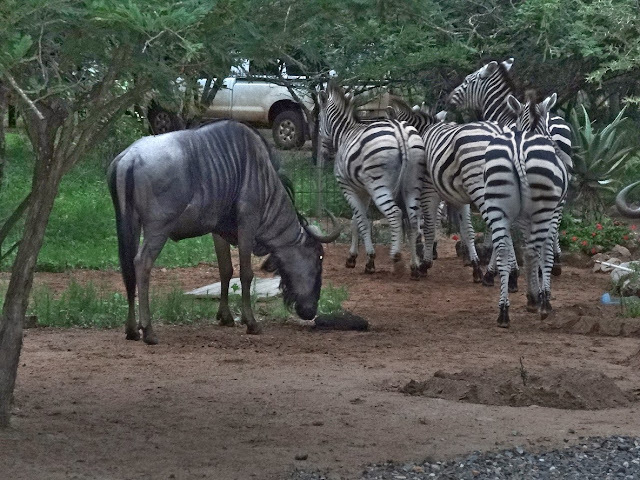 It appeared that the zebras and wildebeests were sharing some tasty morsel on the ground. Over these past few days, the warthog family of nine continues to visit, playful and funny as ever, while an occasional duiker stands ground staring at us or a baboon skitters by checking out the status of food on the veranda. The birds including the three Helmeted Guineafowls make a daily appearance. Again this week, we got a glimpse of the elusive monitor lizards whose home is near the pool, as they slither in and out of their holes, much too quickly for another photo. Tomorrow morning, before taking off for Nelspruit, we have an exciting story to share of an anomaly we found in our yard this morning after writing today's post, with photos, of course. Please stop back to see! On Saturday, we'll be sharing photos of our travels outside of Marloth Park, our first big trip to a grocery store, the much anticipated socks purchase and the dinner at the popular Hamilton's. 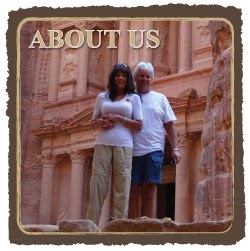 Our course, we'll include all of the costs including the car rental.